Paige @ Pt England School: A Letter From Sir Edmund Hillary WOW! This is a fabulous letter! I can see that you really have thought about what it must have been like for Edmund Hillary staying up on Mount Everest. You have put yourself in his shoes to try to understand what he might be thinking and feeling. 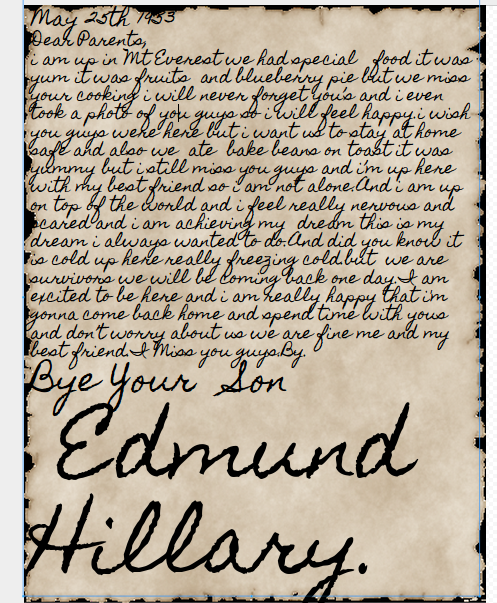 I can see from your letter that you think Edmund Hillary must have been missing his parents while he was there. I'm sure he was very excited, but also very nervous about his expedition. I love how you have said that he misses his mother's cooking! Thank you Ms Nalder you are the best. Wow Paige this is awesome. I love reading what you have shared here. You have really thought hard about this. I love the way you write about 'achieving my dream". Sir Edmund had a very big dream and I wonder if he ever thought it would come true when he was your age. I so hope you have an equally big dream for yourself!